We might be facing a tragedy. One of our worst moments was when our favorite bread bakery, Pacific Bay, closed for business in Bountiful about 15 years ago. Ten years later we found Old Hearth Bread Company in Casselberry and the best ciabatta rolls around. We typical order 5 dozen rolls every few months and freeze them for future use. Yesterday I called to place an order and got a recording saying to leave a message. I left a verbal order and requested that they confirm so we didn’t make an unnecessary 100 mile round trip. No confirmation ever came. So we decided to go ahead and take a chance and drive the 50 miles and confirm that indeed, it was history. Happy ending – they were having phone problems and all was well. We got our 5 dozen rolls plus half dozen kaisers and a loaf of hard crust olive bread. We’re prepared for Easter and our guests – the head count is looking like somewhere between 12 and 14 – a modest gathering by past Easters. Rather than an all out onslaught on Saturday, we started earlier in the week and just did something for a couple of hours every day. My landscaping and trimming are as complete as it’s going to get. The food prep is in the same state. Comes the big event, I think all we have to do is put the hams in the oven. Nancy has already made the Lion House beans and the macaroni salad. I’ve made the Dutch coles slaw, using Chinese cabbage, (does that make it Chinese cole slaw?). We’re debating making carrot salad, we have sooooo many carrots. We’ll also make a batch of smoked bluefish dip using the last of the bluefish. We go to the beach near the end of April so the pressure will be on to restock with fresh blues. I’m fully committed to that, no matter how much time I have to spend on the beach surf fishing. I have big plans for my great, great niece Grace in the garden. I have held back planting a couple of rows of green beans, cucumber plants, and some additional tomato plants. I also can use some help picking onions, scallions, snap peas, and radishes. Lindsay assures me she’s up for it. Another job awaiting her is feeding George’s gold fish. He is back in the hospital, this time for an operation to plug the blood leak they finally found, and I’ve got fish feeding duty. I think she’ll really enjoy that as well. And of course, Nancy has loaded up on Easter candy, eggs, baskets and all sorts of entertaining things for the princess. It’s been a while since we’ve had “little” guests. Tom came up for the weekend. Olivia and Tina hit the beach for a week of spring break and Tom came up here for a few days of fishing. We had fun but the fishing was severely curtailed by lousy weather-windy and wet. Saturday morning we hit Strickland Creek; Saturday afternoon, our lake; Sunday AM the St. Johns; Sunday PM – washed out; Monday morning we got up at the crack of dawn only to find the wind blowing hard. Tom was able to go right back to bed but once I’m up, I’m up. So it wasn’t the ideal get away fishing weekend. We did learn another “don’t” launching the boat. Be sure to remove the motor transom prop before launching. If you don’t, the boat only partially floats off the trailer and somebody has to get fully immersed to unhook it. My palmetto clearing project is progressing nicely. In fact, I’ve thinned out the area I had intended a day or two early. My original thought was to clear cut for an enhanced lake view but I like the way it looks thinned. We get “hint of lake” rather than a full on view. The way the lake is dropping, I’m not sure I could take a full on view of a mud bottom. Nancy outdid herself in the food innovation department. She started with beef ribs which were cooked and then left to settle out over night so most of the grease could be removed. Not sure how she cooked those other than in a pot on the stovetop. Today she added the veggies to create the “stew”. Of course all of those came directly from the garden. Included were the last cauliflower and the last of the shell peas, picked a few weeks ago. The fresh stuff included onions, carrots, zucchini, kale, spinach, swiss chard, and various herbs. Then she put in a new (to us) “grain” that Chris had brought with him, something called farro. He described it as a pasta replacement but I think it’s more of a barley. It fit the stew perfectly and gave it some body. I know when you just list the ingredients, it doesn’t sound too appetizing but believe me, it was excellent. Maybe it only works with really fresh materials. Most of the stuff was picked and in the pot within 5 minutes so it would be at peak sugar content. The interesting thing is that no way could we ever duplicate the meal accurately. Next up – pork shoulder osso bucco. Got up this morning and it reminded me of mornings in Yellowstone on the Firehole River. It was quite cold, the humidity was low and the steam was rolling off the lake. We’re having record or near record low temps and today that was visible. I’m getting through the palmetto project quicker than I thought because the low temps are letting me work longer. I had planned on doing a couple hours each day and finishing up on Friday. Instead, I’m running two days ahead of schedule. Nancy had her follow-up meeting with the oncologist and got a clean bill of health. She goes back every 4 months for the next 5 years for routine testing which is just the standard practice. Except for heavy lifting and over exertion, everything else back to normal. March has sure turned out cool. Things I usually have in the garden are still in the house or well protected under covers in the garden. We’ll have a few days in the 80’s with night time temps in the 60’s and then in comes a cold front that drops the night temps into the 40’s. Too cold for things like jalapeno peppers. It is extending cabbages and the green leafy veggies beyond normal so it’s overall been beneficial. I can protect from cold but nothing at all I can do with a heat overload. It actually looks like this cool trend is going to extend into April so I’ll actually be covering sensitive plants way beyond normal expectations. I grew an oddity in the garden this year-a white beet. I guess it was an albino since it was one of a kind in a plot of about 50 regular, red beets. I had three such beds so it was one of one fifty. Further, I’ve grown beets here for 5 years (with limited success up until this year) but for years in Utah and never had anything but the traditional pure red beets. You could tell looking at the leaves and stem that it was a different critter. Normally the stems and veins in the leaves are dark red but this one plant had white veins and stems. We gave it away along with other beets so we’ll never know if it tastes any different. Too late to think about it now but I never should have given it away without answering that question. It also might have been interesting to have just left it in the ground until it went to seed and captured those seeds. The other oddity this year is the incredible carrots. 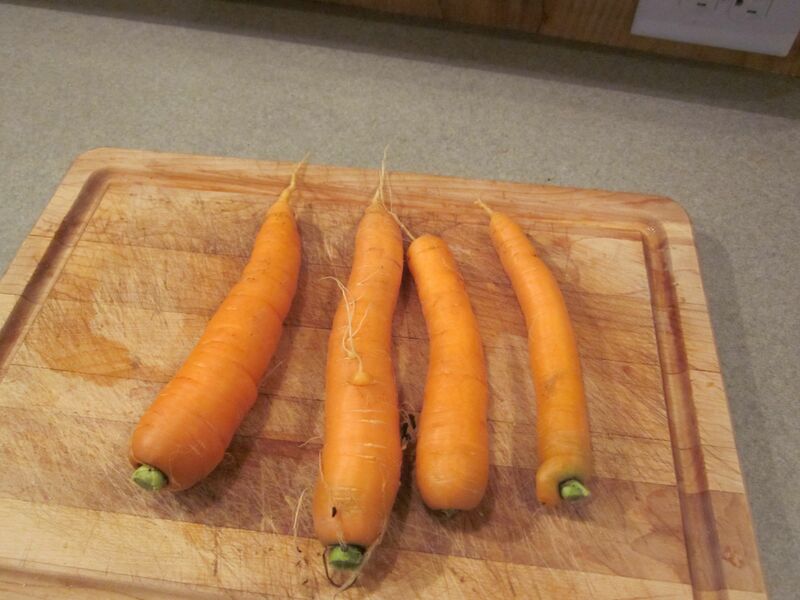 In the past my carrots have been tasty but mostly ugly – all bent and with multiple prongs into the ground. Not this year – beautiful, long, straight carrots and tasting better than ever. As with all the other good stuff, I’m hoping that the difference this year has been the quality of the garden soil crossing over into the excellent category rather than a quirk of the weather. My son, a full time burbian, suggested that my palmettos were out of control. He didn’t volunteer to do anything about it and it just so happens that I had come to the same conclusion a few weeks back so I decided to start a thinning project. The weather is just fine, mid 70’s between 9AM and noon, so now’s the time. We also have Easter creeping up on us and we’re having the party plus the Yearta’s in just a few weeks. My calculation is that if I spend 2 hours a day for about a week and assuming everything in my body holds together, it should look good for the party. My timing estimate didn’t include getting the power cord crossways with the chain saw. Klutz. When alls said and done, the property won’t make full “burb” but then again, this ain’t the burbs and our HOA will be more than agreeable to the new look. It’s in poor taste to put too much pressure on your neighbors by sprucing up but I’ll be well within the limits. The word is that we should expect an explosion of Stink Bugs this year. For your information, there were a fairly good number last year and they play hell with certain crops – tomatoes and squash in particular. I read that planting sunflowers attracts them, luring them to a location for disposal. I mentioned it to my neighbor and he brought over a cup full of sunflower seed he was using for bird feed. I agreed to try growing them but really didn’t expect the seeds to germinate because I thought the seed had probably been processed with heat and chemicals. They started popping up within 2 days of planting them. That’s unbelievably fast. I’ll soon have to decide where to plant them – adjacent to the garden so that the bugs will congregate on the sunflowers instead of tomatoes or away from the garden to lure them from the tomatoes. In either event, the prescription is to keep a bucket of soapy water nearby and just pull infested leaves off the plant and drop them in the bucket. 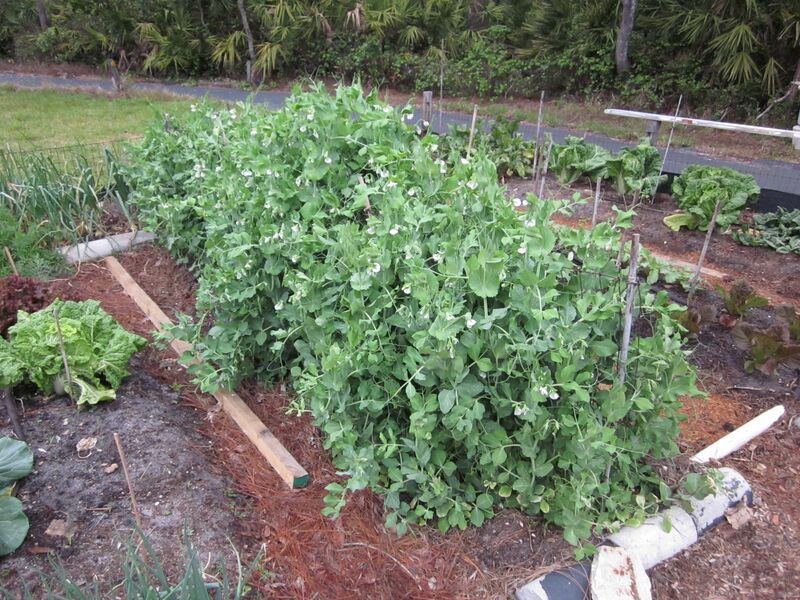 This variety of sugar snap peas deserves a picture. It’s a variety called Cascadia and is starting to produce really tasty peas and loads of blossoms. Peas come on slowly at first-I pick about a pocketful every day. We save these until there’s enough for a meal. By mid season, each day’s harvest is more than a meal so we start the multiple use regime – peas in soup; peas in salad; peas and pasta, peas as a main course veggie; you name it, we try it. As the season tails off, I’m back to the pocketful a day. When it gets down to one meal a week, I yank the plants out and add them to the compost pile. This will be the third and final tranche of peas and concludes the best season we’ve ever had. To calibrate you, this is a ten foot row. Nancy continues to improve – must be the great care she’s getting. She has the first follow-up on Friday so we’ll get a professional assessment at that time but to me, I’d say all’s well. Unfortunately I went down to the dock yesterday to check the lake level. We had a few very cold nights so the ferneries had pumped for several hours each time. It showed. The lake is at, or close to, the lowest level I’ve ever seen and we’ve got at least 6 weeks before the summer rains normally start. George, who has been here since 1984, said it’s the lowest he’s ever seen. I’m wondering if more mucky lake bottom will be exposed than last year when I harvested tons (literally) of bottom soil to mix with the compost and/or directly into the garden. This winter’s harvest has been spectacular and I’m convinced that the rich muck I distributed last spring made a major contribution so maybe there will be a silver lining to the (lack of) black clouds. This morning I was up at the road getting the paper when I heard this galloping sound heading in my direction. I looked up and here’s this really, really large hound dog heading my way. It was a bloodhound looking, black and brown, big floppy ear kind of dog. In a fraction of a second she was brushing against me, her back was waist high to me and it was almost looking at me eye to eye. The biggest danger was being licked to death or knocked over with her tail. Clearly this was a well maintained, very friendly hound that had gotten out of fence somewhere. She followed me back to the house and then headed off to check out the lake. Certainly got my heart started. You can all collectively breathe a sigh of relief – the bush beans and corn that I planted last week and that suffered through a late season cold spell, did in fact germinate properly. I was mostly optimistic but you never know until you see that green poke through. That gives me 6 rows of corn by 20 plants per row. The 2 rows of beans are the first of several that will be planted as the season progresses. The next 2 will go in next weekend with more following every 3 weeks or so until I run out of seeds or space. Also, just to keep the record straight, the 14th blue/purple potato plant finally broke ground so I actually got 14 plants from 14 cut pieces. That’s a little surprising since a couple of the chunks were really marginal insofar as development of an eye but I must have guessed right. I haven’t updated on the Shave Secret in a while. I’ve been using it for just over 2 months, 20 shaves to be exact, and may have used as little as 15% of the oil. So no doubt it will go way past 100 shaves from the 18 ml. I’m also still on the same razor and still getting the closest shaves ever so I have to conclude that it is easier on the razor as well as the face. Let me know how you like the new format. I personally preferred the older one but will get used to this. Apparently, the old format wasn’t very friendly for people using tablets or mobiles, something that wasn’t a consideration a few years back. I was also being routinely bugged by WordPress to upgrade to the latest version. In the past I’ve ignored these kind of requests from software companies and paid the price when they discontinued support. That’s a pet peeve of mine – the software folks keep forcing you to move on, often to worse products, or get left holding the bag. Nancy is doing fine and improves each day. She’s still spending the lion’s share of the day horizontal but is up and about more and more. I’m trying to make sure she doesn’t overdo it so the whole process of healing isn’t interrupted. Her pain has been manageable with Aleve and hasn’t required any heavier meds. She’s eating well. Tonight I have a very special repast planned-pasta with scallops, zucchini, spinach and Rotelle tomatoes. Last week she made something similar using shrimp, spinach, and Rotelle but this is sure to top that. Late breaking update – it was incredible. At the last minute I decided to drop the Rotelle and increase the wine Combined with imported bucatinni pasta, the result was delicious. I did a whole pound of pasta so there’s enough left over for another supper and probably a lunch or two. On the next past, I’ll freshen it up with another batch of spinach. Got another line item to add to my resume – plumber. A few weeks ago I began noticing that when the bathtub or washing machine drained, you could hear it gurgling and bubbling throughout the plumbing. Then when Nancy was in full prep mode for the surgery, it backed up big time. I put on my to do list to call a plumber. My hesitation was that I wasn’t sure whether it was a pipe clog somewhere or a full septic tank issue. Those are two different professions and I wanted to be sure to call the right one because for sure I’d be charged for the house call even if it was the wrong one. Today we did a load of wash and once again it backed up so I called my neighbor and asked for the name of plumber who had recently done some work at his house. He came over and suggested that I try to clear it myself by opening the cap between the house and the septic and trying to break a clog if there was one. I did and sure enough that line was full and stopped up. What a mess – I’ll leave the details for your imagination. I started working a water hose down the line toward the septic tank and could only get a few feet before hitting a total block. The line is about 15’ long. I just worked it for an hour or two, a couple inches at a time, breaking the clog piecemeal until it finally cleared. I did this on Thursday and two days later, the pipe section between the house and the septic tank is dry as a bone. Total success. Joey came up yesterday and stopped at Lowes to pick up a plumbing snake. We snaked the previously clogged line to make sure it was clean and it was nice and dry. I also put the hose back down with a high pressure nozzle on it to finish the job. It’s mid March and we had a freeze last night. After a mild winter, spring is turning cold. No citrus next year for our trees but probably no impact in the garden due to the covers I’ve kept on way beyond normal. I’ve got bean and corn seeds in the ground just a few days from germinating and I’m hoping the over topping soil will provide enough insulation to save them. We went to my 55th high school reunion in Rockledge this past weekend. Wow, have those people gotten old. There were about 40 people so a fairly good turnout considering the size of the class. I recognize about half the people and about three quarters of the names. No big surprises except that one of the guys who didn’t attend but sent in biographic info lives in Bountiful Utah, a few blocks from our old house. I have no idea if he’s been there for long or what but I do know he was living in Palm Beach in the early 70’s so he could have been a nearly neighbor for years and we never knew it. The party broke up early and we debated whether we should drive home or stay overnight with Joey. We stayed – I think a good decision considering the number of Florida Lager’s we polished off. Sunday was prep day for Nancy’s surgery. The prep in this case is the feared and dreaded prep as in colonoscopy prep – although the procedure has nothing at all to do with the GI system. They said it was because the surgery was being done robotically. Still doesn’t make sense to me but I have to trust they know what they’re doing. Monday was the surgery and the doctor said it went perfectly and that he was certain he had gotten all the suspect area removed in one fell swoop. He emphasized how early in development it was and how lucky we were to have caught it when we did. The plan was for her to come home on Tuesday but that wasn’t to be. She had some bladder issues Monday night which set the program back a full day and it wasn’t until Tuesday that we walked out of the hospital and headed home. She has to be restful for about 2 weeks when her follow-up appointment is set. A little walking but not much else in the way of physical activity. The only garden development is that the blue/purple potatoes are popping out of the ground nicely. I had cut the 4 sprouted potatoes that Chris brought the end of Feb into 14 chunks that I thought would develop into plants. So far 13 of the 14 have sprouted and I have hopes for a 100% success. The plants look the same as any other white potato variety I’ve grown. The daily harvest now looks like carrots, beets, onions, lettuce, cabbage, and a cross between broccoli and cauliflower. We’ll be adding brussels, sugar snap peas, and zucchini squash to that next week.